A speakeasy was an illegal bar that operated during Prohibition in America from 1920 to 1933. 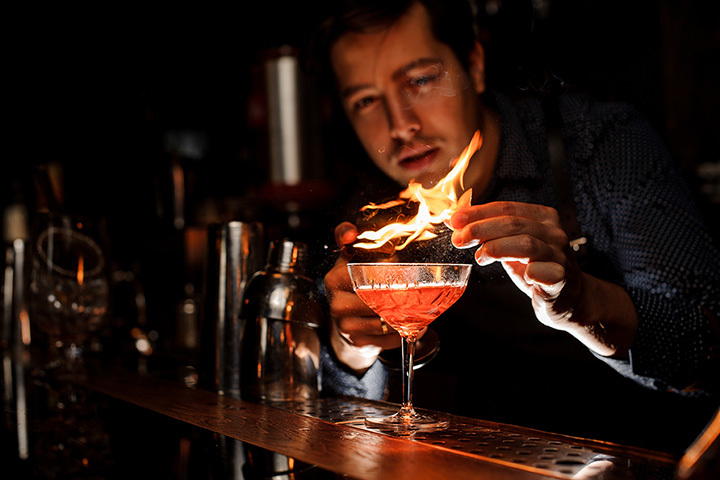 Today, modern speakeasy-style bars across Colorado recapture that low-key atmosphere. Complete with secret entrances and password-protected drinks, these nine best speakeasies in Colorado are sure to offer a great ambiance and a well-crafted cocktail. This Denver shop isn’t just a bookstore but also a speakeasy. You may not realize that this bookstore is a bar but once you enter through a secret bookcase, you’ll appear in a 60-seat tavern. At Williams & Graham, you’ll find classy and well-made cocktails along with desserts and small eats. This Boulder speakeasy is located underneath Hotel Boulderado. License No 1., formerly known as Catacombs, was the first bar in Boulder to receive its liquor license in 1969. This historic hotel and bar serves a great Old Fashioned along with other classic cocktails and unique mixed drinks. Located in Golden, Colorado, Golden Moon Speak is perfect for cocktail lovers, since it has an impressive list of cocktails on its menu. Offering some upscale snack and dessert options along with live music, time spent at this pre-Prohibition-style bar is sure to be a good time. Get a haircut and a well-made drink at this barbershop-meets-bar in Durango. The Bookcase and Barber can serve up an upscale haircut and a specialty cocktail. However to order a drink, you must know the password, which is typically found on their website. The ice cream shop Frozen Matter isn’t all that it appears to be. Through the freezer door is the bar known as Retrograde. Located in Denver’s Uptown, Retrograde is known for both its secret door and its unique craft cocktails. Straying away from speakeasy-style decor, you’ll find a swanky styled space here. The Bitter Bar in Boulder serves up the most well-made cocktails not only in Boulder but the state. Hit up the Bitter Bar during happy hour, when cocktails are served on draft. Head to Denver’s first bar, which opened after Prohibition ended, in the Oxford Hotel. The Cruise Room, decorated in Art Deco-style, offers delicious signature martinis. Enjoy a great meal downstairs at the Arvada Tavern. Afterward, head upstairs to the intimate speakeasy that regularly hosts live music and a lively dance floor. From an Old Fashioned to a French 75, the bartenders at The Arvada Tavern can create your favorite drink. You’ll need to know exactly where you’re going to find this Mile High speakeasy. Located below the restaurant Colt & Gray, head to the unmarked glass door on Platte Street to access Saint Ellie. Enjoy both dinner and a cocktail at this Denver speakeasy.